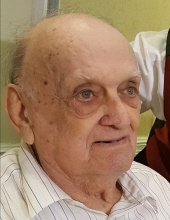 William Stanley Campbell “Bill” of Lumberton was born to the late Aiden Campbell and Elsie Wezneski Campbell on Thursday, May 24, 1931 in Detroit, Michigan and departed this life Friday, April 5, 2019 at Southeastern Reginal Medical Center in Lumberton completing his journey of 87 years. In addition to his parents he was preceded in death by his wife: Mary Louise Campbell and one daughter: Brenda Parker. He is survived by two granddaughters: Amanda Bullard and husband Derek as well as Joyce Jernigan and husband David; four great grandchildren: Amber Warwick and husband Sam, William Warwick and wife Megan, Austin Jernigan and wife Kasey and Hannah Jernigan as well as four great - great grandchildren: Haiden Locklear, Jaxon Bullard, Shaedyn Locklear and Willow Jernigan. Funeral Service will be 3:00 PM Sunday, April 7, 2019 at Boles-Biggs Funeral Home Chapel in Lumberton, Rev. Herbert Lowery Officiating. Burial will follow in the New Hollywood Cemetery in Lumberton. To send flowers or a remembrance gift to the family of William Stanley "Bill" Campbell, please visit our Tribute Store. "Email Address" would like to share the life celebration of William Stanley "Bill" Campbell. Click on the "link" to go to share a favorite memory or leave a condolence message for the family.